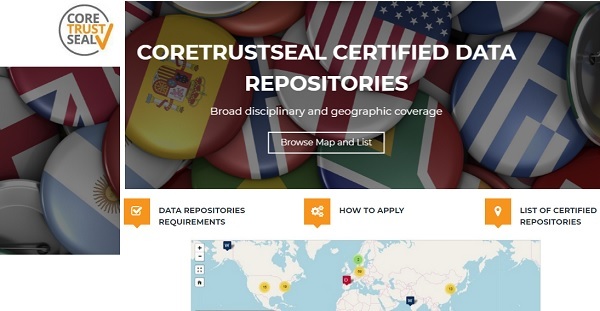 In September 2017, the ICSU World Data System (ICSU-WDS) and the Data Seal of Approval (DSA) announced the launch of a new Trusted Digital Repository (TDR) certification organization: CoreTrustSeal, which is looking to expand to trustworthy software, trustworthy data services, and fitness for use/FAIRness over time. ... offered by the CoreTrustSeal replaces the DSA certification and the WDS certification of Regular Members, and and is open to all interested data repositories. The CoreTrustSeal Board offers all interested data repositories a core-level certification based on the DSA–WDS Core Trustworthy Data Repositories Requirements catalogue and procedures. The CoreTrustSeal “contributes to a significant future focus on the trust that can be placed in elements of a distributed global research infrastructure, and the increased automation of its verification. However, it is the tip of the iceberg”, - Thoughts on Future Trust, ISCU, 2017. The CoreTrustSeal certification is envisioned as the initial level in a global framework for repository certification that also includes the extended (nestor-Seal DIN 31644) and formal (ISO 16363) levels. Ultimately, the CoreTrustSeal will endeavour to provide core-level certification for other research entities such as data services and software. Please note that in order to make a smooth transition to a new CoreTrustSeal online certification tool, the DSA and WDS certifications are frozen for new applicants during November and December 2017. From January 2018 onwards, repositories will be able to apply for certification via the CoreTrustSeal website. Governed by a Standards and Certification Board, the CoreTrustSeal is a community-based, nonprofit organization promoting sustainable and trustworthy data infrastructures. It is committed to supplying a professional service, and in this regard is developing a sustainable business model by introducing a modest fee to cover administrative costs as of January 2018.